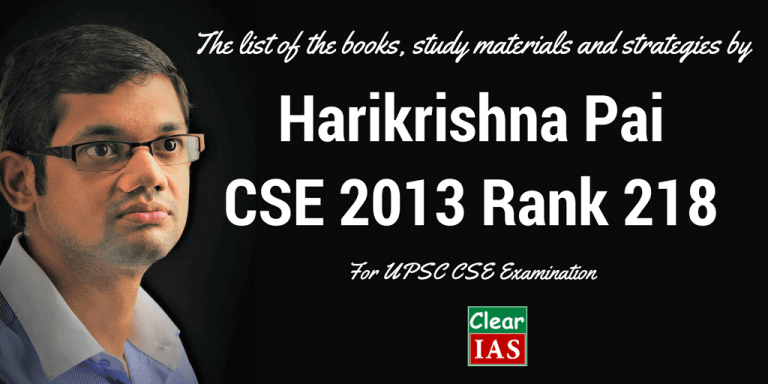 Harikrishna Pai IPS (CSE 2013 Rank 218) shares the list of the books and study materials he referred for UPSC Civil Services Prelims and Mains in this part of his interview with Clear IAS. If you missed Part 1 and Part 2 of the Harikrishna Pai’s, topper’s interview with ClearIAS, follow the corresponding hyperlinks given at the bottom. Now straight into the preparation strategies of Harikrishna Pai and books recommended by him for UPSC Prelims and Mains. ClearIAS.com: Can you elaborate on your preparation strategies/approach and study materials and books used for Prelims Paper 1 and Paper 2 (Please mention books/materials used for each subject)? Current Affairs: Newspaper (The Hindu) + Manorama Yearbook /Mathrubhumi Yearbook. General Studies Paper 2 (CSAT): No Special preparation. Practised sample questions from the institute. ClearIAS.com: Any tips/advice for UPSC Civil Services Prelims? Focus on concepts rather than by-hearting facts. Practice sample questions. Regional Language (Compulsory): (Malayalam): no much effort put. Used to reading and writing earlier also. Old question papers serve as a useful reference. English Language (Compulsory): No special preparation. Essay Paper: [Also mention the essay you wrote] Gave special emphasis to certain most likely areas for the essay (Eg: women’s issues) while preparing for GS itself. No special study other than collecting ideas from available sources. (The Hindu’s Sunday Story (now redundant) is an example, Yojana, Kurukshetra, frontline etc for collecting points ). Practised writing sample essays. Organising thought and presenting various dimensions of the topic are important for an essay. So essay can’t be studied. It is a reflection of our ideas. I wrote on “Gross Domestic Happiness is as important as Gross Domestic Product” – gave a general idea of development perspectives, India’s growth path, major challenges in our progress, what to do etc. General Studies 2: Mostly current related topics asked last time. So Newspaper reading is vital. Relevant topics shall be referred in Introduction to the Constitution of India, D.D.Basu and Indian Polity by Laxmikant. Second ARC fourth report (Ethics in governance) is also good. Bilateral: current issues, IDSA comments. PRS review on bills/policies. Yojana/Kurukshetra for Panchayath, rural development etc. General Studies 3: Economy: current issues + Institute notes from Pala, XIIth Five year plan report (selective reading). Environment- Current issues, relevant government reports of the time, MoEF site + Yearbook. Disaster Management: Concepts from NCERT & CBSE book on DM, ARC report summary, current issues. Science & Tech : Newspaper + Wikipedia search, gktoday etc. General Studies 4 (Ethics): Studied concepts from some notes. Had a general idea about thinkers. No other special preparation. ClearIAS.com: What was your optional subject? Please give some insights on your selection of optional subject also. I chose History. Optional require study in a reasonable depth. So “How far I can do well (both studies & Writing) on this subject?” shall be the single most important question while choosing optional. How far our study method matches with the subject etc needs to be analysed with the help of syllabus and previous question papers. Availability of guidance & books, previous knowledge in the subject etc can also be considered. I don’t believe in scoring/not scoring (subjects) theory which is mainly a creation of coaching institutes. I mostly relied on self-study and got reasonably good marks. Of course, guidance from seniors was valuable in this regard. ClearIAS.com: What was your writing style in GS and optional? Bullet Points/ Essay style or a mix of both styles? ClearIAS.com: What are the government reports that aspirants should go through, before giving Mains Exam? Selective reading of second ARC reports seems useful, but I won’t say it’s indispensable. Important outcomes of committees etc can be important, but newspapers can be effectively used for this. ClearIAS.com: Did you use sub-heading/points/graphs in your essay paper? I used subheadings, but no graphs/bullets. ClearIAS.com: If you didn’t explain it in detail earlier (Qn 1), can you brief on how you attempted the Ethics paper? Strategies and writing style for Ethics case studies? ClearIAS.com: What was your exam-hall strategy for mains: attempting all questions even at the cost of compromising quality or writing only quality answers compromising on the number of questions attempted? My strategy was a tradeoff between these two. Tried to attempt maximum questions at the reasonably good quality. But I faced time crunch in paper II. Click to read Harikrishna Pai (CSE 2013 Rank 218) UPSC Topper’s Interview – Part 1. Click to read Harikrishna Pai (CSE 2013 Rank 218) UPSC Topper’s Interview – Part 2. Click to read Harikrishna Pai (CSE 2013 Rank 218) UPSC Topper’s Interview – Part 4. Click to read Harikrishna Pai (CSE 2013 Rank 218) UPSC Topper’s Interview – Part 5.